The Nutribullet is a top of the range blender (marketed as a "Nutrients Extractor", the website claims it has started a health revolution) and has a cult-like following on Instagram, with thousands of people showing off their photogenic smoothies - and yes I am one of those people. It probably is the best blender ever. It can obliterate anything you'd want to drink in smoothie-form including seeds and nuts. The design is great as it is easy to use, doesn't make loads of mess and the chances of slicing your finger are very small. In terms of durability, we've had ours over a year and the machine itself is still working perfectly - the blade is coming slightly loose but you can purchase new blades and cups for £20 at Argos. The Nutriblast doesn't come cheap at £70 for the blender. I personally think it is worth the money if you use it regularly but if you're just looking to try a smoothie diet then an alternative for you may be the Breville Blend Active. 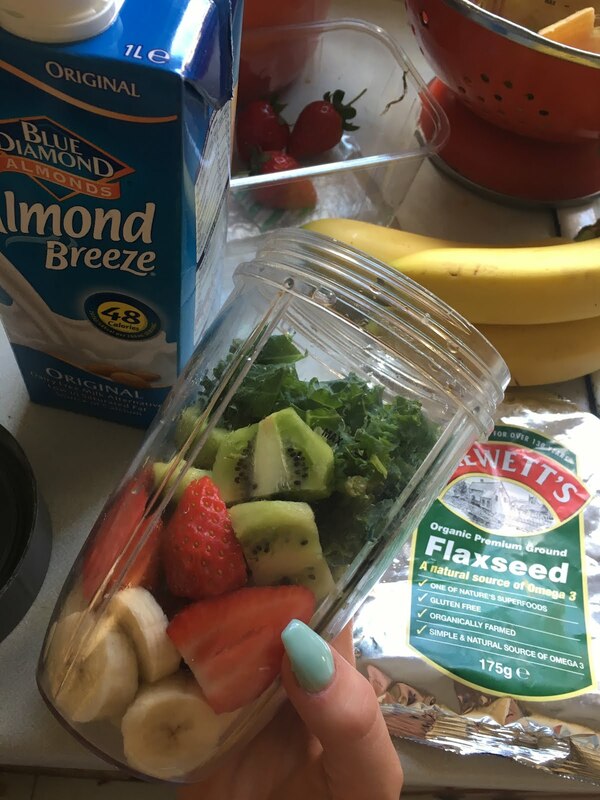 My boyfriend Sam has this blender and I'd say it's a good one to buy if you just want to make a smoothie or shake once in a while but it is no where near as powerful as the Nutriblast (the Breville is only £20 so you pay for what you get). Another slight downside is that if you want to really live the #nutriliving lifestyle then the ingredients don't come cheap! Basic fruit and veg can be cheap to buy but once you take the coconut water, flaxseed, wheatgrass powders, chia seeds, acai berries, almond milk and other faddy but "fashionable" health foods you could be paying £10+ for a smoothie. Banana, Strawberries, Kiwi, Kale, Flaxseed and Almond Milk. This was a really nice one to have for breakfast, because the carbs in the banana fill you up more than just a berry smoothie. Almond milk is lower in fat, carbs calories and has more calcium than cow's milk. Theres literally a hundred reasons why I don't like drinking milk (when you think about it, it makes no sense to drink cow's milk and Khloe Kardashian says she dropped 11lbs giving up dairy. I used a sweetened one for this smoothie, its actually really nice and along with the kiwi you can't taste the kale at all. Orange, Lemon, Carrot, Honey and Ginger. 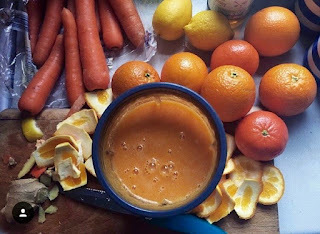 This one is super citrusy and I had this all the time through the winter to try and keep colds away with all the vitamin C. I usually leave some of the lemon peel on (the nutriblast juices in completely) because loads of the vitamins are found in the peel of the lemon. 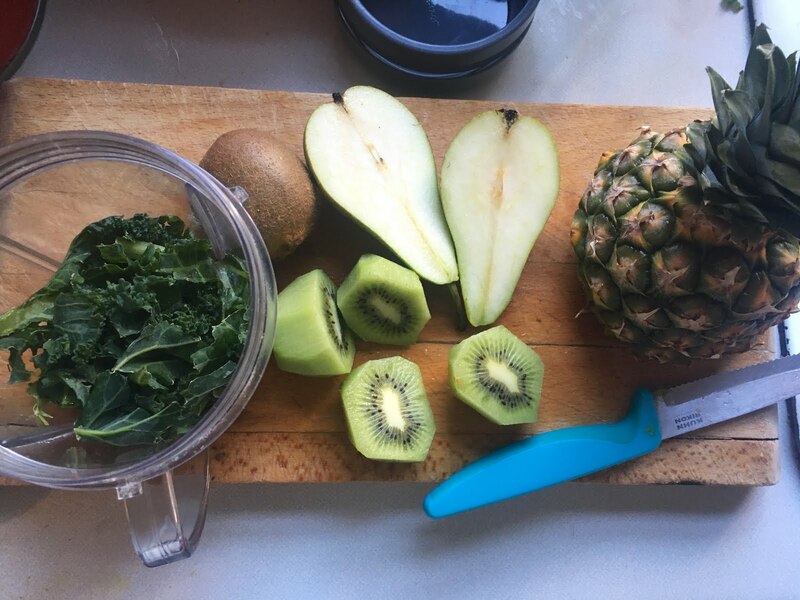 Kale, Kiwi, Pear and Pineapple. This is nice to have as a snack as its fairly filling but still really low calorie - it tastes really sweet which I love and the kale is undetectable. Kale is really high fibre and pineapple and kiwi both have loads of vitamins as well. Spinach, Banana, Peach, Blueberry, Almond, Linseed and Coconut water. Adding coconut water can literally transform a nutriblast, it tastes so tropical alongside banana and is really refreshing. 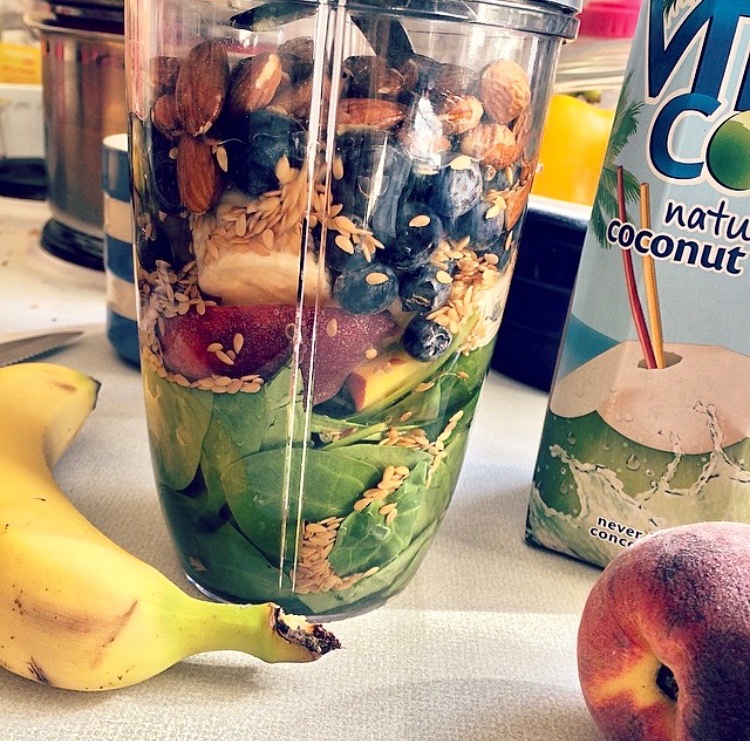 I'd probably have this smoothie for breakfast or lunch as its so filling I'd have it as a meal. Its low fat, has easily digestable carbohydrates, protein in the almonds and omega 3 in Linseed and loads of vitamins and minerals in spinach (which you can put loads of in the smoothie and not taste it at all). This one would probably be at about 450 calories which is why I'd have it as a breakfast or lunch.